debes confiar en todo y respirar muy fuerte…siemprecon una sonrisa! Si, tienes rázon! Gracias, amigita. Un abrazo. Yes… breathe! All will be well! 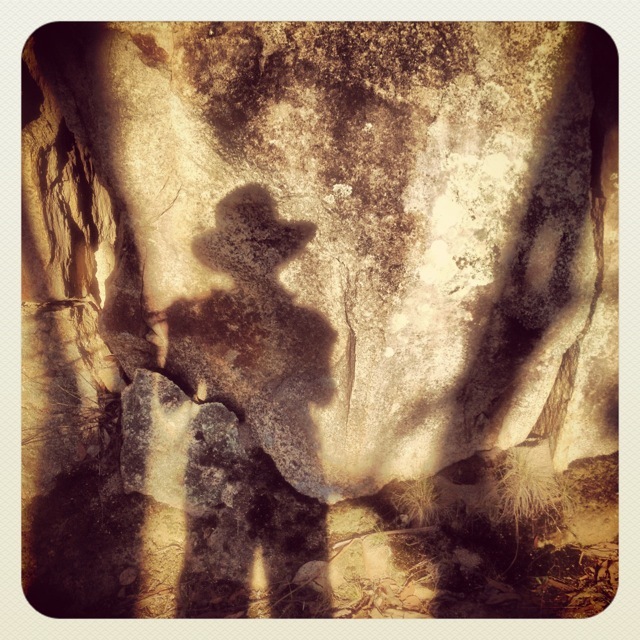 And that photo is great – Indiana Jones eat your heart out! Gracias to you too. I’m practising my Octopushy breathing! Bought a copy at the National Libray on March 21 when we went to see the Renaisance exhibition at the NG. Having read 2 other books on walking the Camino, I was immediately attracted to it. Up to page 84 so far and loving it! How exciting to have had a book of mine at the National Library. And how envious I am that you saw the Renaissance exhibition. Thanks for buying it and I hope it stands up to comparison with the other camino books. And so now I am recommending it to friends so that they too can walk with you and interpret some of your journey through their senses. Comparison? Each has a framework, a perspective, a lens through which the storyteller has experienced and expressed what it meant for them and I am the richer for having read them all. What a wonderful response. “Crafted, soulful. moving.” I could not ask for more. Of course, the reader is the co-creator of the book experience, so those words say something about you, too. Thank you so very much. I’m grateful you enjoyed it, and even more grateful to you for letting me know. Given what you have shared of yourself in the book, you might be interested in going a bit further with the concept of extroversion and introversion. First of all, extroversion/ introversion is a continuum, as we all have both extroverted and introverted functions (sensing, intuition, thinking and feeling/valuing). It is the degree to which each of these are developed that leads to an overall preference to extroversion or introversion in any individual. Your Brooklyn accented psychologist is right, to the extent that he goes. However, for me, the crucial difference is that an extrovert’s reality is the outside (objective) world – what is actually out there and hence can be more easily shared. Whereas an introvert’s reality is based on their internal (subjective) world – eg, what THEY remember, imagine, value and think. As such, an introvert’s reality is idiosyncratic and thus unique, and at times, difficult to fully share or indeed, to understand using our limited language, with introverted intuition being the most difficult. This is intriguing Andrew. Thanks so much. It “feels” true to my experience too! And of course my Brooklyn man was hemmed in by the boundaries of electronic media, where so often complex concepts are required to be reduced to a sound bite. I am finding that an interesting challenge with the book – how to give a taste of its various facets in a “quickie.” All grist to the mill and a learning curve. I’d love to explore further. Do you have recommended reading on the subject? I may not get to it for a little while, but I keep a wish-list of books by my desk at all times, and when I have a moment I plunder the library and bookshops for nutrients. Jung is probably still the best source – but his writing can be pretty heavy going.